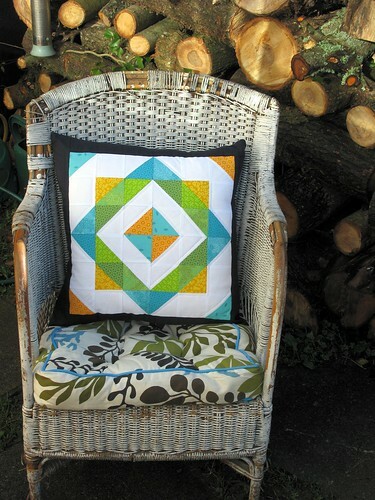 Here is the finished cushion cover I made for my swap partner, Moira, who blogs over at Kettleboiler. I used the Lynnebob Square Pants block and tried to make it look like a blue square was lying over an orange one...making green where they mixed, but I'm not sure that it worked. I surrounded it in some lovely navy linen and finished it with a zip using this tutorial on MissMake. I loved the way the zip went in and I will use this tutorial again. 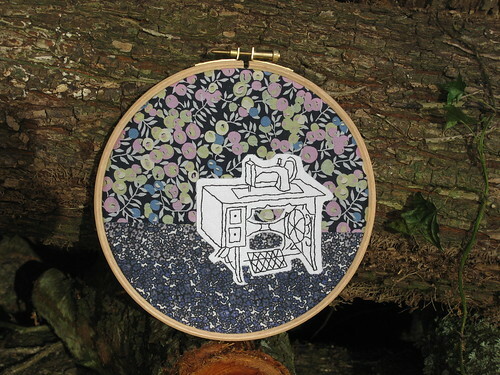 I made this Liberty fabric hoop as a little extra. It is inspired by the 365 hoops that Lucky Jackson made over a year. If you haven't seen them then take a look at the blog here or in the Flickr group there are some fantastic designs and some of the embroidery patterns are for sale in her Etsy shop. My swap partner was Celine who blogs at EspritPatch and I received this lovely Sunny Spiral Star cushion cover and some yummy Lindt chocolate....which unfortunately was eaten before it made it into the photo. The quilting is amazing as it is a spiral in variagated thread. I love the colours and particularly liked the fact that it wasn't white and so will stay clean a lot longer. Celine even added piping around the edge, a great finishing touch...that I have not yet tried! This was a lovely swap to be in and I had fun stalking my partner and reading her blog. Swaps are a great way to try out new things and make stuff that you wouldn't normally try. There are lots of ideas in the Modern She Made Flickr Group of what I might make in the future. This map of the UK cushion in particular is going to a lucky partner, and Lee hopefully might produce a pattern for it soon. oohh I bet Moira's well chuffed! 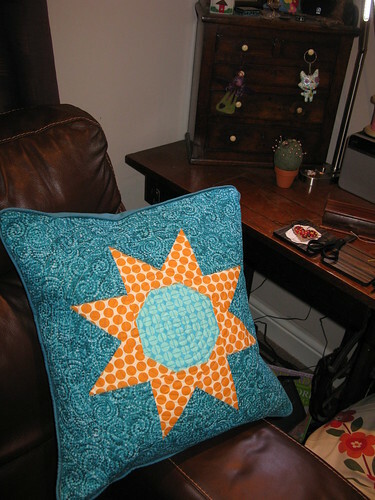 The cushion is fabulous and I love the blue over orange idea, it works really well. The hoop is gorgeous too! Love your cushion! And didn't you get a good one too. Great swap all round then. Looks like a very successful swap and you totally succeeded in the blue over orange square thing! Is that a knitted cactus I spy? You do jump about between blogs - and I thought I'd lost you! Love the cushion and the liberty ring.